Buying an external SLR flash unit is the first step toward improving the results you get from your flash photography. Like many other digital SLR accessories, there are a wide range of features you can get on your external SLR flash, and the number of features is directly related to how much the flash costs. With some flash features you'll be able to see immediate improvement in the quality of your flash photos, while other more subtle features only become apparent when you use the flash under rigorous conditions. If you're not familiar with flash terminology, take a read through the digital SLR flash glossary before you begin. Every digital SLR camera has a connector on the top of the camera called a hot shoe: this is the most common and obvious way to connect an external flash unit to the camera. 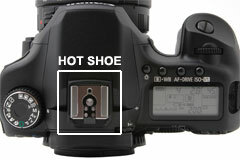 Hot shoes have electronic connectors that can relay information from the SLR to the flash, but only when the flash brand matches the camera. In this sense, flash units are a lot like lenses: for best results, buy a flash that's the same brand as your camera. While you can rig a Nikon external flash to work with a Canon digital SLR, this requires extra cables and is not as easy as simply attaching the flash to the hot shoe. Furthermore, off-brand flash units will only work in manual mode, and can't leverage the two-way communication between camera and flash. The first question you have to answer when considering the purchase of a new flash unit is "will this flash suit my photography needs?" In order to help you quickly determine if external flash is the right way to go, here are some pros and cons of these types of flash units. Relative to some other flash lighting solutions, external SLR flash units are small and portable. They pack easily into a camera bag, which means that it's more likely that you'll carry the flash at all times. Many run on standard AA batteries and don't require any special power source. They are more powerful than the pop-up flashes built into the cameras, but don't have quite the same output as larger studio strobes and professional lights. Most of all, these flash units are inexpensive relative to the other options - you can get your hands on a great external SLR flash for about $150 (as compared to a starting price of $400 for larger lights). About the only con of small external SLR flash units is that they don't have quite the same light output as larger more professional lights. If you really need to fill a large space with light or need enough light output so that you can use fast shutter speeds, then these types of flashes may not be the best for you. However, you can use more than one of these external flashes to achieve increased light output and still at a fraction of the cost of professional heavy-duty lights. The main purpose of an external flash unit attached to the camera's hot shoe is to provide you with more light output from the flash and to eliminate red eye. Red eye is caused by light from the flash reflecting off the back of your subject's eyes and into the lens. It happens most often when there is little distance between the flash unit and the lens. Since an external flash sits well above the lens, red eye in your portrait photos will be significantly reduced. In addition to providing space between the flash and lens, there are some other features of an external SLR flash that you can consider. There are only a handful of external flash units that don't have bounce (the VERY inexpensive ones). When a flash has bounce, it simply means that you can angle the flash head so that it doesn't point straight ahead all the time. You can set the flash head to a 45 degree angle, and even point it straight up so that you can "bounce" the light from the flash off the ceiling. Bouncing flash produces a softer more diffuse light than lighting your subject head-on. Swivel is a lot like bounce: it means that the top of the flash can be rotated to point to the left or right. While any flash with swivel also has bounce, the reverse is not always true: there are some flash units that have bounce but NOT swivel. Swivel just gives you more flexibility about the direction of light. With a bounce flash, the only real surface you can bounce light off of is the ceiling. But what if the ceiling is too high? With a swivel lens, you can also bounce light off of nearby walls or any other vertical surface that will reflect the light back onto your subject. The light output of different external flash units is described using the Guide Number. There's a direct relationship between guide numbers and price: as one increases, so does the other. Judging how much power you need from your flash has a lot to do with how you intend to use it. For example, if you just want to fill in shadows in portraits that you take outdoors, you don't need a flash with tons of power. If you really want to take portraits of people in semi-dark environments and always want to bounce or diffuse the flash in some way, then you're going to need more power to properly light your subjects. If you're unsure about what guide number to look for, my best advice is to err on side of too much power. Here's why: you can REDUCE the light output of a flash to match the subject and available light, but there's no way to INCREASE flash output if you're at the maximum setting. In the world of the modern digital SLR camera, you don't need to know a thing about lighting ratios and flash-to-subject distance to get decent photos with an external flash. This is because modern flash units communicate electronically with the digital SLR camera and are aware of a variety of camera settings including focal length of the lens, shutter speed and aperture. The camera relays all this information to the flash so that the flash puts out just the right amount of light to illuminate your subject. However - if you really want to leverage the full potential of your flash - there may come a day when you want to control the light output manually (this is especially true if the flash isn't locked onto the camera's hot shoe). Some less expensive flash units are fully automatic and have no manual overrides. Once you pass a certain price point, then the flash will have both manual and fully automatic control. If you have utterly no desire to set flash output manually, then ignore this feature when considering your external SLR flash purchase. When it comes to external SLR flash, the best bet is to use a flash that's made by the same company that made your camera. While there are plenty of ways to make third party flashes work with modern digital SLRs, getting a flash made by the same company that made your camera is the path of least resistance: you know for sure that the flash is going to "get along" with your camera. As you delve into more and more off-brand options, the ease-of-use factor diminishes. For example, you'll gradually lose more and more of the automated functionality the flash has to offer since its electronic contacts aren't compatible with your SLR.